The argument from ignorance is a curious phenomenon. The gist is that people take their lack of understanding of some phenomenon, and from that ignorance deduce that their own particular explanation must be the correct one. Of course, you can't deduce anything from a lack of understanding. As Neil deGrasse Tyson put it, "If you don't know, that's where your conversation should stop. You don't then say that it must be anything." I saw a particularly good example of the argument from ignorance a couple of days ago, with the hoopla that is arising around a mysterious action by the FBI over a solar observatory in New Mexico. On September 6, the Sunspot Solar Observatory near Alamogordo, a research facility operated by New Mexico State University, was closed without explanation and all of its staff sent home. The observatory has been closed since then, and all requests for more information have been met with steadfast silence. Alisdair Davey, a data center scientist at the National Solar Observatory, which works with the SSO, said, "We have absolutely no idea what is going on. As in truly nothing, which in itself is just weird." What is even more peculiar is that a post office on the grounds of the SSO has also been shut down without explanation. Rod Spurgeon, a USPS spokesperson, said he didn't think the two were related. "Whatever’s occurring there has nothing to do with us... I haven’t heard of anything like [a biohazard or bioterror incident] going on." Liz Davis, a public information officer at the U.S. Postal Inspection Service, concurs. "There is no criminal activity, which is what Postal Inspection Service would be dealing with," Davis said. The SSO sighted the spacecraft of an advanced alien race with which the US government is having dealings, so the whole place was shut down to prevent anyone from finding out more. The SSO intercepted a top-secret communiqué from a top-secret government satellite, and the result is that all of the staff has been rounded up and put under house arrest until they'll sign non-disclosure agreements. Because the SSO isn't far from Roswell, something something something crashed spaceship in 1947 something something. The SSO discovered that a solar flare was on that way that was going to incinerate the Earth, and the powers-that-be didn't want the astronomers telling everyone and causing havoc. Given that the observatory closed on September 6, and here we all are, un-incinerated, you'd think this one would have been discounted. Maybe this is a really slow-moving solar flare, I dunno. Some of the scientists at the SSO found out that the secret mission of the facility was using magic tractor beams to mess with the weather, and they had to be silenced. The argument here, if I can dignify it with the name, is that since HAARP closed down a couple of years ago, the Evil Government Weather Manipulation Program had to be moved elsewhere, and this is the elsewhere to which it had been moved. The fact that in the last few days we've seen two amazingly powerful killer storms -- Hurricane Florence and Typhoon Mangkhut -- is displayed as "evidence." Because powerful hurricanes don't occur every year, or something. The FBI took over the SSO because they're going to modify the station to send out mind-control rays and turn Americans into mindless sheep. From the fact that 36% of us apparently still support Donald Trump, it appears to be working. 'cuz that's what you say when you have no information. 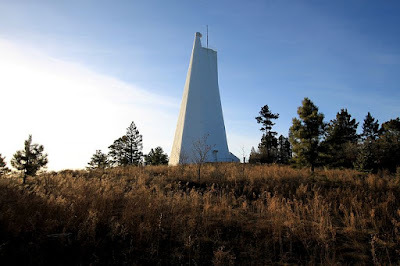 I agree with the conspiracy theorists insofar as the FBI's action is rather curious; what earthly reason they could have to take over a remote solar observatory without explanation is beyond me. It may be that at some point we'll find out why the incident happened, or -- because we're talking about the FBI, here -- we may never know. Which, of course, will just fuel the conspiracy theorists further. More nothing? Yay! That just proves we're right! But if we're going to approach this whole thing skeptically, we have to be willing to allow ourselves to remain in ignorance -- indefinitely, if need be. It's not a comfortable position for a lot of us. People like to have explanations for things. Certainty is reassuring. The universe makes sense, everything has a reason. To once again quote Tyson, "You can't be a scientist if you're uncomfortable steeped in ignorance. Because scientists are always at the edge of what is known. If you're not at the edge, you're not doing science." In any case, keep an eye on the news, and watch out for stories about spaceships or satellites or weather modification or mind-control rays. Or, perhaps, some more reasonable explanation of what happened. The latter is what I'd put my money on. UPDATE (as of Tuesday morning) -- the SSO has reopened, and while the details are still not entirely clear, authorities are saying that "a suspect in the investigation potentially posed a threat to the safety of local staff and residents." See? I told you it wasn't aliens. There's still no information on exactly what kind of threat the suspect posed. That should settle that, but of course it won't, because the conspiracy theorists will take the lack of details and spin that into a whole new set of claims. You can't win, which we sort of already knew.